Understanding who is interacting with a computing device has many implications and applications. It is most often used for authentication, where only certain users are permitted to use the system or privileged functionality. It can also be used for personalization, where different users can have custom settings, browser bookmarks, email accounts, favorite applications and so on. Furthermore, knowing who is performing what action is also tremendously valuable in co-located collaborative systems and interactive games. We propose CapAuth, a technique that uses existing, low-level touchscreen data, combined with machine learning classifiers, to provide real-time authentication and even identification of users. As a proof-of-concept, we ran our software on an off-the-shelf Nexus 5 smartphone. Our user study demonstrates twenty-participant authentication accuracies of 99.6%. For twenty-user identification, our software achieved 94.0% accuracy and 98.2% on groups of four, simulating family use. Guo, A., Xiao, R. and Harrison, C. 2015. 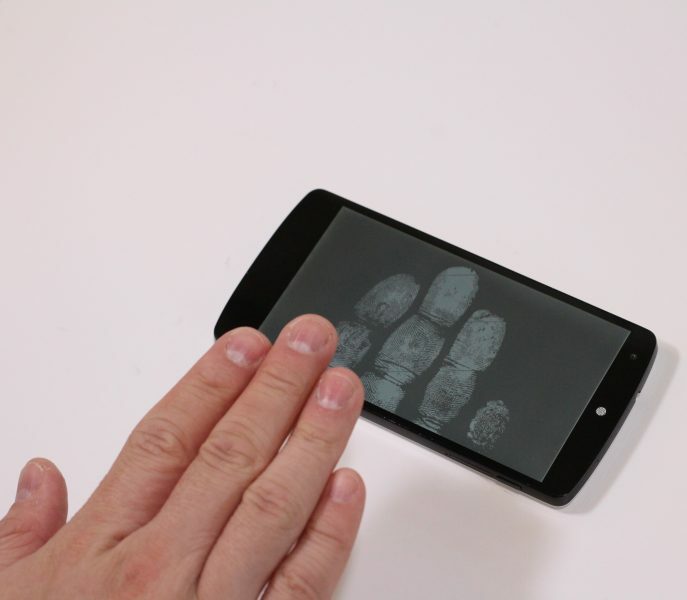 CapAuth: Identifying and Differentiating User Handprints on Commodity Capacitive Touchscreens. In Proceedings of the ACM International Conference on Interactive Tabletops and Surfaces (Madeira, Portugal, November 15 – 18, 2015). ITS ‘15. ACM, New York, NY. 59-62.